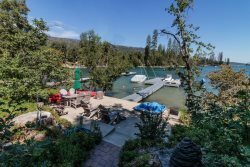 This home provides everything your large family could desire for a great time at the lake! The big and beautiful house has a large open main room with living area, dining table, and the kitchen. Downstairs there is a huge media and game room with 5 recliners, large-screen TV, pool table, and more! The master downstairs bedroom opens up to the patio, and has a king-size bed. The ground floor main bedroom opens to the deck, and also has a king-size bed. Another bedroom has two full-size beds. Upstairs, the loft holds one more full bed. Outside the house there is a deck with a massive gas grill, and a net-tent seating area that can keep you away from any flying insects in the evening. On the ground level there is a large patio that overlooks the forest around the home, and leads to the bridge and path down to the private boat dock on the lake. The exclusive boat dock has two slips. Your team was always helpful. We really enjoyed our stay at Kelleys Krew House on Bass Lake.